He's the only guy on the planet who knows exactly how to extinguish a sharknado by throwing home made bombs into it. 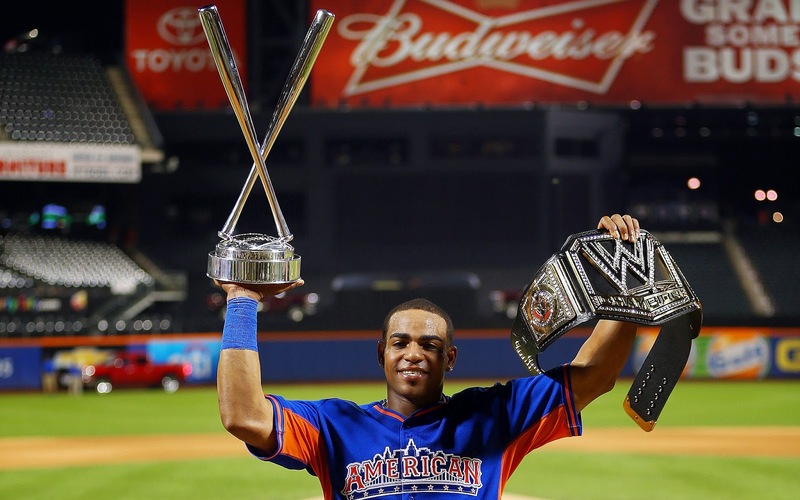 Yoenis Cespedes, 2-time HR derby champ. I'd rather have Lester. This season the Red Sox brought back their entire starting five that led them to a World Series last year, but now Clay Buchholz (and his team-worst 5.87 ERA) is the lone man standing. I'm not completely sold on the John Lackey trade, or the fact that they didn't just pay Jon Lester a long time ago. Other than that I like each move they made individually, but collectively I'm not so sure. As I wrote this morning in my Bleacher Report article Grading the Boston Red Sox Trade-Deadline Performance (which I highly recommend reading), I think in this case the total could well be less than the sum of the parts. The Sox are a big-market team behaving like a small-market team. It's going to take some major moves this offseason to keep the rotation from being an absolute disaster in 2015. Early thoughts on the Red Sox dismemberment, and did Oakland make a mistake? Nine days ago the Red Sox were the hottest team in baseball. Playoff hopes had been rekindled, and I wrote an article for Bleacher Report suggesting nothing big would happen before the trade deadline. A lot can change in 9 days. 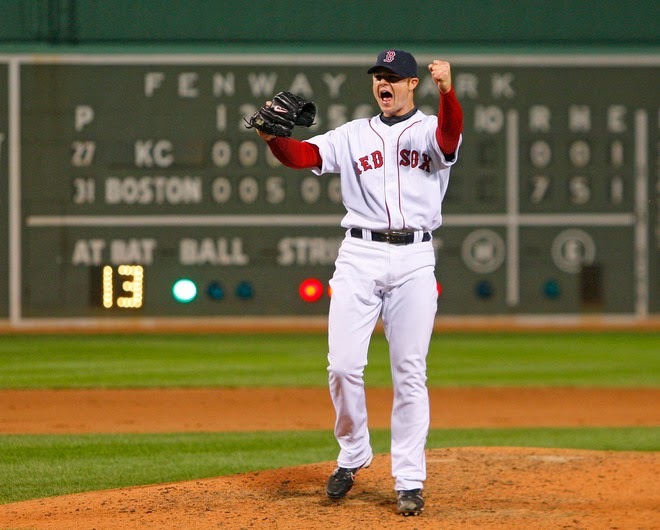 Jon Lester's no-hitter in 2008. I was there. I think it could backfire big time for the A's. When you're the best club in baseball, why risk messing with your team chemistry like this? The A's already had the lowest starter's ERA (3.32) in the American League; they seem to have addressed a need that wasn't even there, with the chance of disrupting everything they have going right now. As far as Lester goes, I hate to say it, but I think it's highly unlikely he comes back to Boston as a free agent. If you can name a superstar player who was dealt away at the deadline then returned to his previous team in the offseason, please let me know. It's just not something you really see happen in sports. As I wrote a year ago, the thing that made the original Sharknado great was that it was "a comedy masquerading as a horror movie. It's so intentionally fake and terrible that it's basically a parody of itself, which makes it funny." From a quick look at the IMDB page for Shaknado 2: The Second One, I count no less than 16 moderately famous people in it. Sixteen. It's a fairly remarkable phenomenon for a terrible movie to be so bad that it's good; and then even good enough to attract additional celebrities for the sequel. The SyFy network is going to obliterate everything else on TV at 9 pm tonight. How crazy is that? 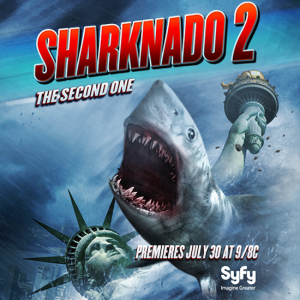 Sharknado 2 will also be the most tweeted about program in television history. Wrap your brain around that one for a minute. Whoever is behind this at SyFy deserves some sort of entertainment industry gold medal for incredible success in the face overwhelming odds. 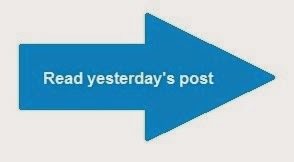 I got the above email from Ticketmaster yesterday (click here for coupons). I was a little surprised by this, because as far as I knew the NBA's 2014-15 schedule did not exist yet (I think the league is still unsure as to whether or not they'll follow LeBron's orders to extend the All-Star break). 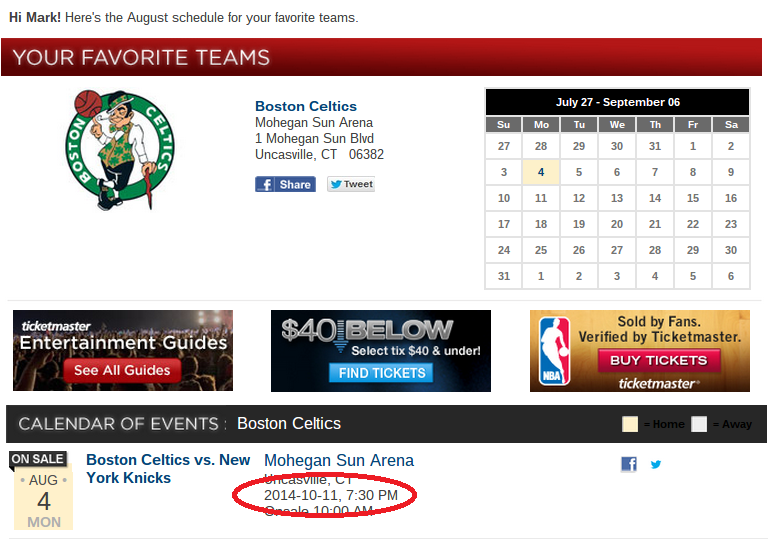 I decided to take a quick look at Celtics.com, but the site has nothing about the upcoming season under either the "Schedule" or "Individual Game Tickets" sections. Preseason games aren't mentioned anywhere. 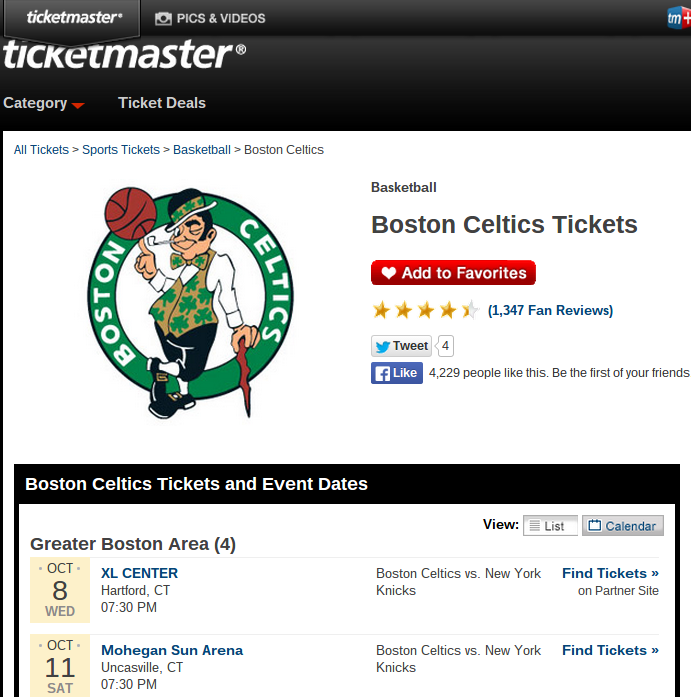 On the off chance you're dying to go to Connecticut in mid-October to watch an exhibition game or two between the Celtics and Knicks, you're in luck! 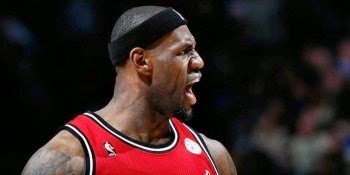 Back in February I wrote a blog entitled LeBron James whines about not getting enough time off during the All-Star 'break'. "The NBA is considering extending the All-Star break into a seven-day hiatus next season, according to a report by the South Florida Sun Sentinel. Citing multiple sources, the Sun Sentinel reported that the league currently is using the week-long All-Star break as its 'model' while filling out the 2014-15 season." 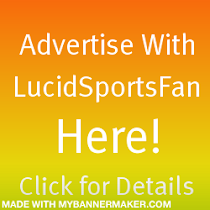 "I just think what Michael Jordan has done for the game has to be recognized some way soon. There would be no LeBron James, no Kobe Bryant, no Dwyane Wade if there wasn't Michael Jordan first. He can't get the logo, and if he can't, something has to be done. I feel like no NBA player should wear 23. I'm starting a petition, and I've got to get everyone in the NBA to sign it. Now, if I'm not going to wear No. 23, then nobody else should be able to wear it." I guess LeBron is over that sentiment, as he's now planning to go back to No. 23 in his return to Cleveland. Could someone ask him about this please? Also, how very LeBron-esque was that quote about how if not even he is going to wear 23 then nobody should? Classic. I got home from dinner last night and flipped on the TV. The Red Sox were about to lose their fifth straight, so I started searching through the guide for something else. Obviously I had to stop scrolling when Billy Madison came up. 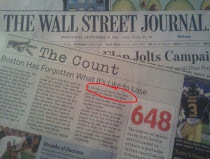 In fact, in the very early days of LucidSportsFan.com I compared the film to a Sox-Yankees Opening Day matchup.